The First Sea Lord and Chief of Naval Staff, is the Royal Navy's professional head and Chairman of the Navy Board. He is responsible to Secretary of State for the fighting effectiveness, efficiency and morale of the Naval Service, and supports the Secretary of State in the management and direction of the Armed Forces. Appointed First Sea Lord and Chief of Naval Staff in April 2016, Admiral Sir Philip Jones is the Royal Navy's professional head and Chairman of the Navy Board. Born in Bebington, Cheshire and educated at Birkenhead School, he joined the Royal Navy in 1978 and, after training at BRNC Dartmouth, he read for a degree in Geography at Mansfield College, Oxford. His Fleet training, following graduation, took him to the South Atlantic in 1982, where he saw active service in the Amphibious Assault Ship HMS Fearless. His early complement appointments, as a bridge watchkeeper, navigator and Principal Warfare Officer in a number of Type 21 and Type 22 frigates, and in HM Yacht Britannia, took him on deployment to the South Atlantic, Caribbean, Gulf and Far East. He then served on the Maritime Battle Staff, embarked in the aircraft carrier HMS Invincible for the ORIENT ‘92 deployment to the Far East, and then her sister ship HMS Ark Royal for Operation GRAPPLE in the Adriatic in 1993. Promoted to Commander, he then commanded the Type 22 frigate HMS Beaver from 1994-6, including a Mediterranean deployment with the NATO Standing Naval Forces conducting Operation SHARP GUARD. He then served in the Directorate of Navy Plans in the Ministry of Defence (MoD) during the 1997-8 Strategic Defence Review, and on the staff of the Flag Officer Surface Flotilla (FOSF). In 1999, as a Captain, he returned to sea for two years in command of the Type 22 frigate HMS Coventry, which included her final deployment to the Caribbean to conduct Counter Drug Operations in 2001. He then returned to MoD to serve as Military Assistant to the 4* Chief of Defence Logistics, before a tour on the staff of Flag Officer Sea Training, directing the planning and execution of Ex JOINT WARRIORS. He is a graduate of both the Joint Service Defence College and the Higher Command and Staff Course. In 2004, as a Commodore, he led the C4ISTAR Division of the Fleet Headquarters as an Assistant Chief of Staff to the Commander-in-Chief and then, in 2006, as the Commander Amphibious Task Group (COMATG), he led the ATG on the VELA deployment to West Africa and then through training and validation for a period in the NATO Response Force while on deployment to the Baltic. Promoted to Rear Admiral in 2008, he completed two short tours, first as the Flag Officer Scotland, Northern England and Northern Ireland (FOSNNI) and Flag Officer Reserves, and then as Commander UK Maritime Forces (COMUKMARFOR), which included activation as the Op Commander for EUNAVFOR Op ATALANTA, conducting counter-piracy operations off Somalia. 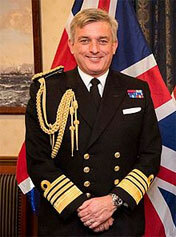 Appointed as the Assistant Chief of Naval Staff (Policy) in 2009, his thirty months in MoD included the 2010 Strategic Defence and Security Review and 2011 Defence Reform Review, and culminated with him being made a Companion of the most honourable Order of the Bath in the 2012 New Year’s Honours. On promotion to Vice Admiral in December 2011 he became Deputy Fleet Commander, Chief of Staff Navy Command Headquarters and Chief Naval Warfare Officer. Then in November 2012 he became the Fleet Commander and Deputy Chief of Naval Staff. He was promoted to be a Knight Commander in the Order of the Bath in the 2014 Queen’s Birthday Honours.